IN THE ANNALS of American architecture, there is perhaps no more spectacular record of the moving of a house than that of the Longyear home from Marquette, Michigan, to Fisher Hill, Brookline, Massachusetts. John Munro Longyear, son of Judge Wesley J. Longyear of Detroit, Michigan, judgment and industry served him well as one of the developers of the vast lumber and mineral resource s of the Northwest. “John, you work like a fool,” said one of his packers to him when he was making his early explorations of that region. He was an empire builder, and in the process, accumulated a fortune. Longyear home overlooking Lake Superior at Marquette, Michigan. In 1890, he began the construction of a half-million dollar homestead overlooking Lake Superior at Marquette, Michigan. 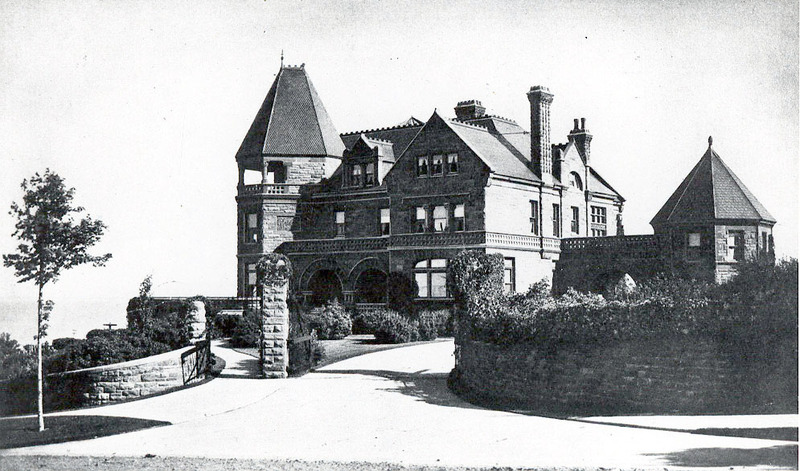 The home, occupied in 1892, was much loved by the family but within a few years the expanding railroad interests wanted to obtain from the Longyears the land at the foot of the cliff on which the house stood. This would destroy much of the beauty of the location. Negotiations with the railroad failed and when news reached the Longyears in Paris, Mr. Longyear told his wife while driving down the Champs Elysees that he had decided to move the house from Marquette. The single offer that he had had from a possible purchaser of the house was little more than a token payment. The builder of the original house then advised Mr. Longyear that the structure could be moved and most of it used again. 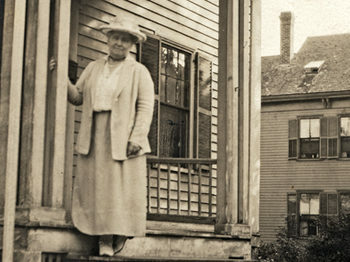 Various locations were considered but Fisher Hill, Brookline, was the final and unanimous choice of the family, which included five children and the parents. For this new undertaking, Mr. Longyear employed the architects of the original house, Charlton and Gilbert, and the original builder, Charles G. Van lderstine. Dismantling in Marquette was begun in January, 1903 and by June, work was underway at Fisher Hill. Each block of stone was wrapped in straw and cloth and numbered. The entire dismantled building was sent to Beaconsfield Station, Brookline, by two freight trains with a total of 190 cars. Mr. Longyear had purchased the Fisher Hill property, a site overlooking the City of Boston and adjacent hills. The property lay between Seaver Street and the Brookline Reservoir on Fisher A venue. The house was placed across what had been a section of Hyslop Road. During these years of rebuilding the house, which was reoccupied in 1906, Mr. Longyear had also been exploring and acquiring rights to undeveloped coal fields at Spitsbergen, Norway. A memorial to his work survives today in the name of the port village Longyearbyen, or Longyear Town, near the Spitsbergen coal mines. The area was to become internationally important within a few years. The history of this important work may be read in the Library of the Longyear Foundation, in Nathan Haskell Dole’s America in Spitsbergen, two volumes, fully illustrated. The original house at Marquette was approximately square. With additional needs for the family as well as requirements of the land, an L-shaped house was erected on Fisher Hill. Many changes were made but the original character remained. The kitchen was moved from the basement to the first floor, a large bowling alley was installed and a music room and sun porch were added. When completed, the house had about 100 rooms, while the Marquette house had had 64. Practically nothing was broken in shipping, and windows, doors, and many structural units were re-used without change. As far as possible, the house was made fireproof. The main stairs are of concrete and covered with wood and an ornamental balustrade. Other stairways have steel steps with wood covering or overlay. Book tile, specified for the roof, was delayed so long in delivery that copper roofing was substituted. Many wooden structural beams in the original house were replaced by steel ones. 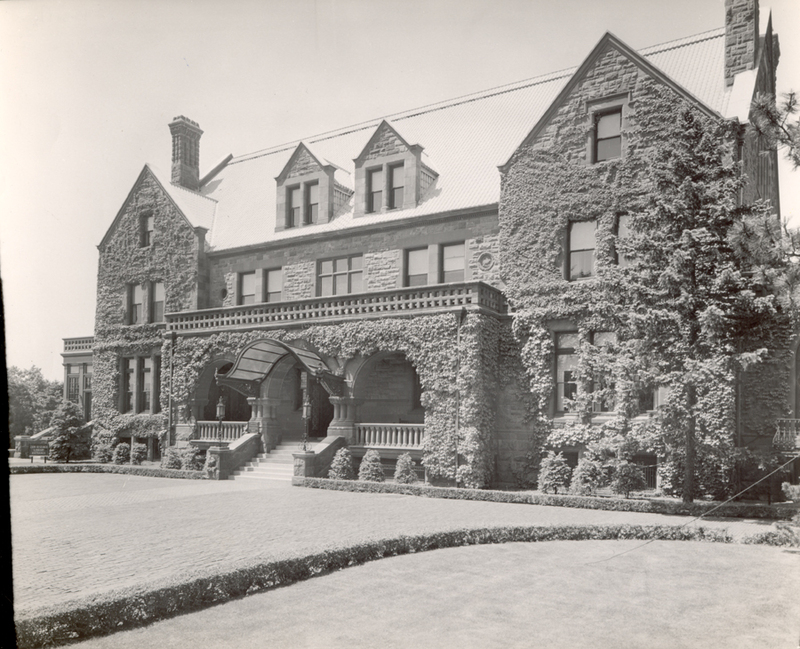 When the Longyear house was completed and occupied on March 25, 1906, it had about 50 percent more space within it than the original house. The Marquette house re-erected in Brookline. Fisher Hill was practically barren of trees at the time the house was erected. Within a few years, however, the entire area of some eight acres within surrounding walls had been landscaped in the manner of the Hudson River Valley gardens of the 1890’s. The Hunnewell Gardens at Wellesley, Massachusetts, were also originally laid out in this style. Today the Longyear grounds survive as a rare example in New England of this notable style of landscaping. The combination of formal and informal areas offers challenge to the visitor as he moves from one garden area to another. Longyear has been fortunate to have had one of its groundsmen serve for nearly fifty-four years. During the college years of the younger sons and daughters, the family greatly enjoyed the beauty and facilities of this home. The children married and went away. Mr. Longyear passed on in 1922, and for the next ten years, until her passing in 1931, Mrs. Longyear welcomed Christian Scientists from all over the world at her Fisher Hill home. Photographs of many visitors form a valuable record of the early workers now preserved in the Longyear Foundation collection. During her later years, Mrs. Longyear created an exhibition gallery for portraits in rooms on a lower floor. 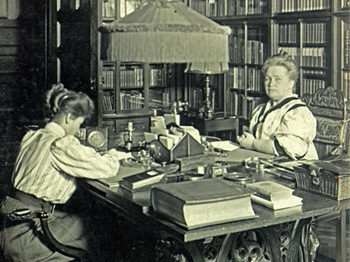 She also provided reading facilities for guests, which anticipated the library now part of the Mary Baker Eddy Museum. 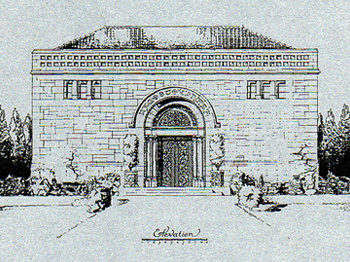 She had made provision for the establishment of Longyear Foundation in 1926 and by 1937, the house was opened to the public, with exhibits displayed throughout much of the building, illustrating by photograph, document, or portrait something of the earthly life of Mary Baker Eddy and her work as Discoverer and Founder of Christian Science. Many portraits, books, and manuscripts have been added to the collection over the years through the generosity of supporters and friends. This article was originally published in the Spring 1969 Quarterly News.